Ceramic knives are the best kitchen knives you can possibly get. 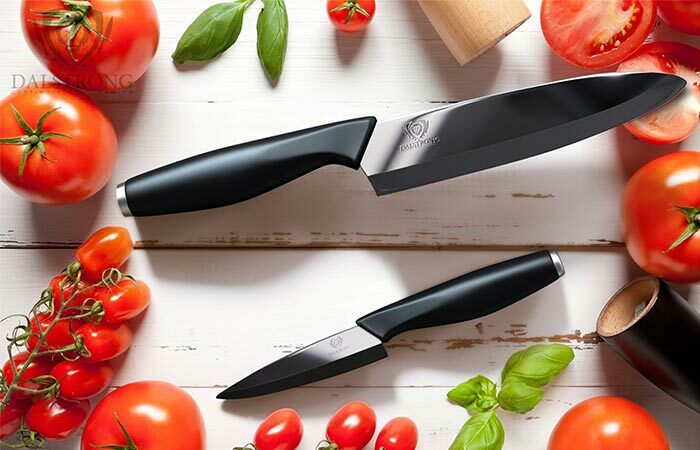 The reason why they’ve become widely popular among home chefs is the fact that they are rough, extremely sharp and the hardest knives available. Dalstrong offers a set of their Infinity Blades, professional knives that will serve as the ultimate kitchen slicing and dicing tool. The first thing you need to know is that these knives are 2 times sharper than steel ones. Also, they are crafted using 200 tons of pressure applied to the highest quality zirconium powder that’s near diamond hardness. With them, you can slice ultra-thin with almost no effort. 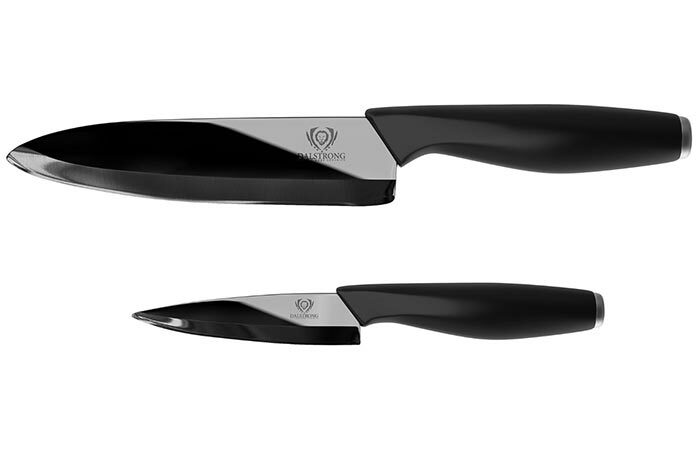 With this Dalstrong set, you’ll get a 6.5 inch Santoku knife and a 3.75 inch Paring knife. The edge of Dalstrong Infinity Blade will hold 15 times longer than steel edges. As a result of this high-quality material, the knives won’t brown, leave metallic tastes, or absorb oils and acids. Not to mention they are completely BPA free, germ resistant and nonporous. Ceramic Infinity Blades are two times stronger than steel knives, they are much sharper and their edge can last 10 times longer. The handle of the knife fits perfectly in the hand and provides you with expert precision. The edges are hand polished, resulting in a blade that’s 30% sharper than other ceramic knives you can get on the market. Another key feature we must mention is that knives in this set are much lighter than steel ones. 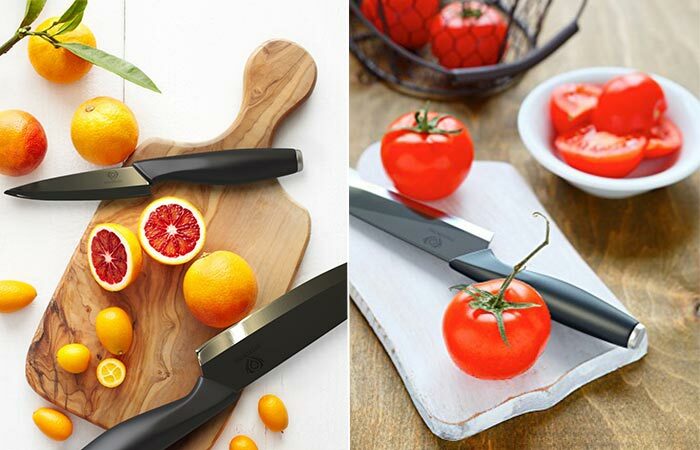 With the Dalstrong set of ceramic knives, you’ll equip your kitchen with ultimate high-quality slicing and dicing tool. The set includes a 6.5 inch Santoku knife and a 3.75 inch Paring knife. Together with the knives, you’ll also get a sharpening cradle, PerfectFit sheath, and polishing cloth. They are comfortable to hold and very easy to clean. Check out this video and learn more about Dalstrong ceramic knives.